You may remember when I confessed my disappointment upon meeting Clay Mann during Boston Comic Con a few months ago. I didn’t go into any detail other than to say that I walked away feeling let down, and left it there. But as it turns out, and as anyone smarter than me could evidently have told you, there’s not much you can say on the Internet that won’t eventually be discovered. As such, Clay Mann found me. And he messaged me. And he apologized. It was extraordinarily kind—not to mention unexpected—and has certainly given me a much different perspective on the experience I had. And I just wanted to share that with you all, because he’s a stand-up guy, and doesn’t deserve to be thought of otherwise due to something I may have written here. 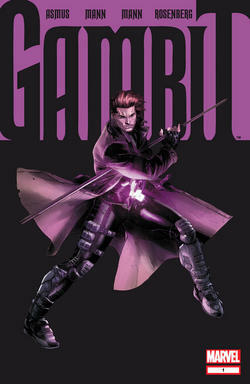 You may or may not know that Clay is working on a new Gambit title that was announced recently. And while Gambit is far from being one of my favorite characters (I’m probably in the fangirl minority there), I’ll still give this book a shot, because one of its creators was kind enough to reach out to a disheartened fan. That should mean a lot. This entry was posted on 06/12/2012 by ravenhaired. It was filed under Awesomeness, Comic books, Conventions & Shows and was tagged with Boston, Clay Mann, Gambit, Marvel, Mind blown.